I am not a revolutionary, nor a big risk taker. No, thank you, I do not want to do a handstand on the edge of a cliff, nor do I endorse anyone who does. I do tend to be more conservative in my actions, yet liberal in my outlook on life. I love the discipline of practicing all kinds of physical sports and I love the freedom of play. I like to understand how things work, and like to investigate things myself typically before I share them with others. I have been a music teacher, classical musician, consultant in the field of disabilities, a student of indigenous healing techniques, a horticulturist, and a yoga teacher. Though I have felt as though I did a fairly good job at all of the things I have done for my work, I will tell you that I have saved the best for last. I am a very good teacher of real yoga. Mary Byerly yoga instructor: defining real yoga. What the heck do I mean by real yoga? Well, let me begin to define through what real yoga is not. 1. Anything to do with what you are wearing. I mean, I love a great pair of yoga pants, but real yoga can be done in something from the 80’s Olivia Newton John “Let’s Get Physical” lineup to those sweatpants that you will never wear in public, with the ratty old t-shirt from your first concert (I don’t care who the band was, though I do see a research potential for matching musical tastes to yoga styles). It can be anything you want if you are just getting your yoga on in the comfort of your own home, and it can be close to anything you want if you are going to yoga with others. When doing yoga with others, make sure you can move your body to the full range of your ability comfortably and without revealing your very personal habits and choices to the rest of us please. 2. Concerned about your shape or level of fitness. I mean, we all start with what we got. If beginner, find an appropriate class that will help you learn what you want from the huge information vault of what yoga is and what it can do for you. You do not need to be able to touch your toes or qualify for the Miss/Mister Universe contest. As long as you can breathe, you can do yoga. If you find a teacher who suggests you can’t do yoga for a reason relating to your size, shape, color, religious beliefs, life-style preferences, clothing, income, or any other label, find another teacher. Now, a teacher may tell you that one type of class may not be right for you (such as a newbie trying out the advanced Ashtanga series). And if this happens, ask that teacher for clarification if you are not sure. Yoga and Yoga Nidra class. Did I mention that this was someone who had a really hard time staying still for longer than 60 seconds? Had I known, I would have said that it was the wrong class for him to start with. He did great – a lot of twitching and moving during that two hours, but he stuck through it. And told me afterwards that it was the hardest thing he had ever done. Did that class help him decide to do yoga? type of yoga that was right for him. Yoga was great for him – the kind that gave his body a good amount of activity balanced with a good amount of stillness, which he loved. Nothing to do with the shape of his nose, color of his skin, or even his temperament. Yoga is for all, and a good teacher can help you find the right match. 3. Just stretching. Yes, it can help you gain flexibility, and strength. And it can also help you focus, be more compassionate, calm, and connect with your deepest wisdom. It can do that in a myriad of ways that can be from sweating like crazy to swooning in ecstasy. It is a practice that can take you deep, so respect that possibility. If you just want a workout, just go do a workout. If you want something that can touch you on more levels than just the physical, welcome to your yoga practice. 4. A religion. Yes, it is based in Hinduism. Modern yoga does not have to be something that changes or challenges your spiritual beliefs though. Yoga is not a religion, and is not in and of itself a cult. Some people who lead yoga organizations may have their creed based in religion or may approach yoga as a religious activity, and some even insist that you take some serious vows of obedience to the leader of the organization. If that is not for you, you will find plenty of styles and teachers who do not base their approach in religion. The philosophy of yoga is vast and an important underlying piece of the practice though, so if you are not interested in that, then perhaps a stretching or agility class is better suited to you. 5. Exclusive. It is inclusive. 6. Sexual. Unless you are going to a Naked Yoga class – in which case, you know what you are getting yourself into. Seriously, while the practice of yoga may make you ecstatic, it is not a hook-up club. Can you get attracted to fellow practitioners – sure. Can a teacher get attracted to a student – sure. Can a student get attracted to a teacher – happens all the time. In the first scenario, that is all cool, and a fun story that you met in yoga class. In the second and third scenarios, not so cool. Teachers, first stop being the teacher before you date someone. Students, stop being a student of a teacher before you date the teacher. This is a practice that goes into way too many levels for casual dating to be ok between teachers and students. Don’t do it. Ethics are important, and the yoga room needs to be a safe space for everyone. The psychology of why it is not cool for teachers to date students is clear. End of subject. 7. One style fits all. Nope. There are some forms of it that will appeal to you and some forms that will not. Some of the old school teachers from India even insisted that yoga needs to be taught one on one to be truly effective. I agree. 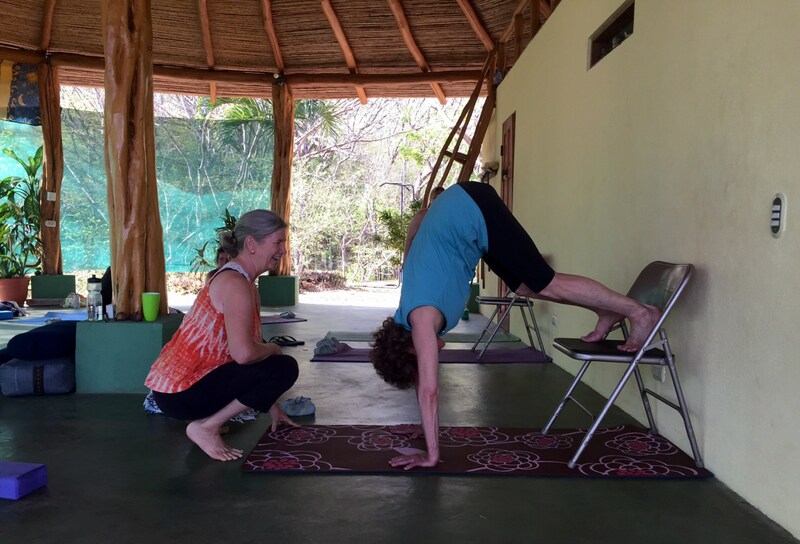 While group classes can be fun, your best yoga can be found by working with a good teacher who can guide you to the specific things that will take you where you want to go with your practice. Discover the way that you like your yoga, and find a great teacher to guide you if you want to go deep. If you don’t, no worries. You then, have lots of choices! 8. A Cure All. Life is still happening off your mat. Yet, it can give you tools to make your life more manageable, and enjoyable. Just don’t expect that starting a yoga practice will make your life all better all the time. Much of what you learn in yoga can help tremendously, and may give you ways to help deal with the rough patches, but it is not a magic pill. 1. One path that can lead you to a deep connection with your higher consciousness. Notice that I wrote “one”, not “the only”. As Gandhi said, there are many paths which can lead you here. In my humble opinion, it is a great path! 2. For all people. Have no fear if you don’t look like the typical yogi/yogini. There is no typical. As long as you can breathe, you can do yoga. business of yoga has boomed, there are those teachers who are doing it for various reasons. There is nothing wrong with wanting to make a good living, which can be hard to do as a yoga teacher. Just use your good judgement, and choose your teacher wisely. If you want a knowledgeable, serious teacher because you want to learn, seek one out, we are out there. If this is an important part of your life, take the time to find the right person, who represents yoga and lives the yoga you are seeking. 4. An art and a science. A good teacher will blend both into their teaching. 5. Deep and spiritual. Consistent practice that is right for you will take you to those places of connection. It has been called “self-realization” or “self-remembrance” in that it takes you to the place of seeing and communicating with your soul. Welcome home! Niyamas, to how you interrelate with the world, its all yoga, baby. So while there are a plethora of styles and teachers to choose from, find the teacher that keeps it real. Find a teacher that keeps it real. It means, if your main aim is to rock your handstand cliffside, go on with your bad self, and find another teacher. I love arm balances, inversions, working up a good sweat, finding my edge and seeing where I can take it…for me and where I am at in that moment. I also love working to figure out honestly what is going on with me so I can balance my body, mind, and spirit, and am good at helping others find that same place. Because of all the other fields and jobs I have held, I have some great skills that have served me really well now as a yoga teacher. You can see more on my about page.